She began college in the late 1960s, pursuing a degree in psychology, although business was what she had on her heart. “I didn’t know it was OK or acceptable at that time,” Sadler said explaining why she was taking psychology classes instead of business classes at first. She switched majors and nothing else mattered. Women were stepping into new roles and she was right there on the front lines and credentials were important. After graduating, Sadler went to work for Mayor Richard Lugar and then went on to work at the Indiana Department of Commerce. While she was there, she met Stan Sadler, who was working in commercial real estate sales downtown. He encouraged her to take classes to become a Realtor™. Again, credentials and a deep knowledge of the field were important to her, so she took all the classes and exams necessary to not only be a licensed real estate agent, but a licensed broker as well. By the time Jen and Stan married, both were licensed and ready to open Sadler Real Estate in their mutual hometown of Martinsville. When the business was established, Jen was the sole owner, which suited her desire to handle the details of a corporation. It was 1978 and a fitting beginning of a business that has stood both the test of time and markets for more than 40 years. The Sadler family name had been embedded in the community for generations. Stan’s folks at the time were actively involved in the government and civic activities in Martinsville and Morgan County. The couple wove their life and livelihood into the fabric of the area. Stan handled the commercial and land transactions and Jen took on the residential side of the business. 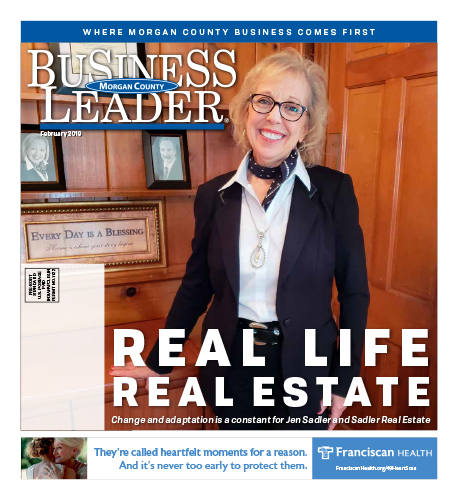 Part of her contribution to the success of Sadler Real Estate was to always pursue the certifications, credentials, and the continuing education and knowledge that kept the firm on top. She achieved the Graduate Realtor Institute Certification (GRI) and the Certified Residential Specialist (CRS) designations, which only a small portion of realtors obtain. According to Jen, the couple were well suited partners, in life as well as business. She says Stan was affable and never met a stranger, and she was detail-oriented and organized. Their business was an extension of their lives as they welcomed three children, Joe, Amanda, and John to join Stan’s daughters, Catt and Jane. Life was chaotic, and wonderful, according to Jen. “You just do it,” Jen said. “With children you learn to juggle, not just time but finances, too. Sometimes I wonder how we did it.” All chores and jobs were tag-teamed by the parents as needed. Sometimes she was the business woman working long hours and Stan was Mr. Mom and that was fine with him, she said with a smile.